Wildcare's mission is to rescue, rehabilitate and release sick, injured and orphaned native Australian wildlife. Wildcare can also help to relocate potentially dangerous native fauna such as snakes. Whilst many areas of our region—like Wamboin and Bywong—have a wonderful range of abundant wildlife, there are large areas in Palerang where the native wildlife has been eradicated through habitat loss (such as farming or development). However, more and more people are wanting to get involved with protecting all wildlife in the local area, supporting and encouraging it back into areas where it was once native. To do this there is a need to create wildlife-friendly properties; by controlling domestic animals; removing or minimising the impact of barbed wire and mesh fencing; taking care in the use of bird netting and pesticides. Whether it is a kangaroo, echidna, possum, wombat, parrot, galah, bat, lizard, turtle, venomous snake, spider or a host of other native animals there is much we can do to enjoy their presence, live alongside them and help them when needed. Law protects all wildlife and if an injured or orphaned animal is picked up it must be handed into a licensed wildlife group or a National Parks and Wildlife ranger. It is illegal to keep wildlife unless you are licensed. Wildlife needs the right food and housing. Carers need the skills to ‘train’ animals to be ready for eventual release back into the wild. Baby animals can grow quite large and they eventually become unmanageable—raised in the wrong way means there will be little chance in rehabilitating animals back into the wild. Some wildlife, such as venomous snakes, spiders, bats and larger animals can be dangerous, so there is a need to be vigilant and aware of what is around. In your backyard it is best to keep the immediate area around the house and yard neat and tidy, so you can see what is around. Snakes, such as the tiger and brown, are some of the most venomous snakes in the world. There is no need to be alarmed if a snake unexpectedly appears, as left alone it will just move on. Remove rubbish and woodpiles away from the house to avoid being surprised. Snakes are attracted to frogs, so expect them by a water feature, or in the chook feed or sheds chasing mice. Snakes hibernate in stone walls and woodpiles (as do lizards) and will seek out cool spots in the summer heat—so be aware and take care when working in the garden. Be very careful where you put your hands when gardening or moving things around. It’s important that mums and dads teach their children what to look out for and not pick up anything that looks snake-like—often they can be mistaken as a lizard. Snakes can find themselves inside houses coming in through open doors, windows and holes. Never tackle a snake yourself—stand back, watch it, be patient and call in the local wildlife group such as Wildcare (see www.wildcare.com.au), or the Native Animal Rescue Group (see www.narg.asn.au) who have people that are trained to remove them. If you use netting around plants, trees and shrubs keep it off the ground so that snakes don’t get caught up and give you a surprise. Bird netting needs to be propped up to help avoid snaring birds and bats and it should be checked regularly. Snakes are protected animals and it is illegal to kill them. If you are bitten, be calm, apply a pressure bandage up and back along the length of a limb, immobilise the casualty and call 000. With correct and immediate first aid there will, in most circumstances, be plenty of time to treat the effects of a bite. Bats may carry the lissa virus and care should be taken in how they are handled. Calling in trained resucers from the local wildlife groups will ensure such handling is carried out by properly vaccinated people. Some spiders can be poisonous e.g. the red back, but all spiders are useful to have around to help keep the insect population in check, including flies. Give all large animals a wide berth to avoid being bitten or kicked, including adult kangaroos and wombats. Most drivers don’t hit wildlife on the road, as they are vigilant and drive slowly in wildlife-rich areas. If you want the best chance in avoiding an expensive bump, then reduce speed to give time to react, avoid ‘tunnel vision’ and look around much more. Know where wildlife crossing points are and take extra care at dawn and dusk and through the night, as that is when animals are moving around. Kangaroos may be unpredictable and their fur colour provides good camouflage too. Locals get to know where kangaroos are likely to be and where they cross the road, but that is of no use if a motorist is simply going too fast to stop. At 80 km/h, allowing for thinking and braking distance, you will need 54 metres to stop the car before impact. However at 60 km/h one only needs 33 metres to stop. Older cars will take a longer distance to stop. Just because you can legally travel fast down our rural roads, think about what a safe speed may be depending on the conditions and time of day and that there may be native animals around. Looking ahead and matching visibility with braking distance is very important if the risk of hitting a kangaroo is to be reduced. A ‘Shoo Roo’, which is available from auto accessory shops, may also help to stop kangaroo accidents happening. If you come across a wombat on the road don’t expect it to run away. 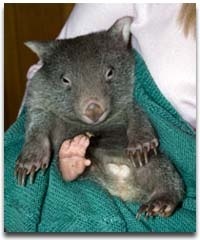 On hearing an oncoming vehicle, the first instinct of a wombat is to stop and crouch. It will not move away until it understands what the noise is. If you have avoided a wombat on the road, stop, go back and chase the animal off the road—but do it safely. In spring birds may also be swooping low over the road, so slow down and look out. Whether a wombat or kangaroo, please check dead and injured animals on the roadway to see if there is a Joey onboard or loitering nearby. Call your local wildlife group for advice and help. In moving a woodpile or fallen tree, be aware that there may be a lizard family or echidna tucked away. Dead trees, logs and hollows provide homes for small mammals, birds and possums, so help protect creatures by leaving them alone. Some property owners are happy to leave large areas of bush undisturbed to give wildlife a chance to get on with life. To attract wildlife think about putting a shallow bowl of water out for small birds and lizards in a clear area—a plant pot dish with a rock in it is ideal. Birdbaths are great for all birds, but they must be in clear areas so they can see what is around. In spring birds tend to fly lower, as they become engrossed on building nests and feeding young chicks. Swooping Magpies are being protective of their nests , so avoid those areas for a few weeks or carry a brolly! Taking care of our wildlife includes having domestic pets under control and not allowing cats and dogs to roam on their own. Cats kill off a huge amount of wildlife and do most of their damage at night, so owners need to keep them inside overnight. Uncontrolled dogs chase animals causing immense stress, injury and death to wildlife and indeed stock animals. If you like living in a wildlife rich environment please take charge of your pets. Fencing can also be a problem for a large variety of native animals. Barbed wire acts as a fishhook and snare birds and bats. Fences can be too high and cause kangaroos to get caught in the top wires. If fence wire is low against the ground it can trap ground-hugging animals like echidnas and lizards. Fine mesh and inter lock fencing traps smaller animals and can be an impenetrable barrier to many animals. Property owners can remove fencing where it is not needed, particularly near wildlife rich areas. Top and bottom wires can be removed and gaps left in mesh fencing if possible to provide a greater ease of passage for the variety of native animals that move between habitats and to us that sometimes means crossing properties.